In an economy as tough as this one, college graduates are going to find it difficult trying to land a job, much less build a career. 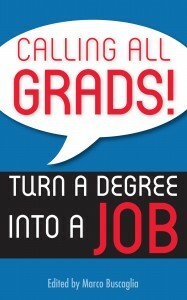 But Marco Buscaglia has put together a useful resource in a book called “Calling All Grads!” that may just give college graduates that slight edge in finding employment and climbing that slippery career ladder. Buscaglia should know something about this topic – after all he’s assigned, written and edited more than 2,000 job-related stories since he started working on the employment content pages for Tribune Media Services since 2001. To that effect, this concise yet comprehensive guide covers a wide variety of useful topics that includes identifying your career path, actual job search, and professional networking (both online and offline), amongst others. There are great tips on how to present yourself, both in the form of cover letters and resume to land an interview, as well as how to dress and carry yourself during an interview, and on workplace etiquette once you have that job (and learn how to keep it). I like the various “How I Did It” mini case studies that highlights an actual experience and brings advice to life. The flow of “Calling All Grads!” is somewhat choppy, however, as though the book was put together from various short articles originally written for newsprint (it probably is). But that shouldn’t detract from the extremely useful advice enclosed within for the ambitious, career-minded new graduate who’s adamant on making his or her mark in this world. And for the price of $6.99 a copy of “Calling All Grads!” for the Amazon Kindle – or the price of a couple of beers – you’ll get to set your future right. That, to me, is a good investment.